I’m working on a couple of recipes using Krusteaz Gluten-Free breakfast mixes for Hot Breakfast Month (February) – I’ll post them really soon. In the meantime, I wanted to tell you about a dinner idea using their wonderful Gluten-Free Honey Cornbread Mix. 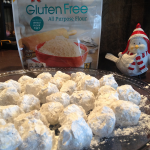 Krusteaz Gluten-Free flour and gluten-free mixes are some of my favorite things in the world. I’m THRILLED to see them popping up in grocery stores everywhere. The cornbread mix makes perfect, perfect, perfect cornbread and corn muffins each and every single time. I’ve added jalapenos to the mix many times and it’s always phenomenal. One day last week, I made Sloppy Joes for supper. If I don’t happen to have gluten free rolls or bread on hand, I’ll often put the Sloppy Joe Sauce in a gluten-free flour tortilla, corn tortilla, or simply place it on a bed of lettuce and top the whole shebang with onions and pickles. We actually had some Sloppy Joe Sauce left the next night and since it’s so darn delicious, I didn’t want to waste it. Use it up, wear it out, make it do, or do without! I didn’t want to do the same-o same-o, though, so I decided to try something different. While I slowly warmed the sauce up, I made the Krusteaz Gluten-Free Honey Cornbread mix according to the directions on the box – throwing in a tablespoon of freshly diced jalapeno for fun. 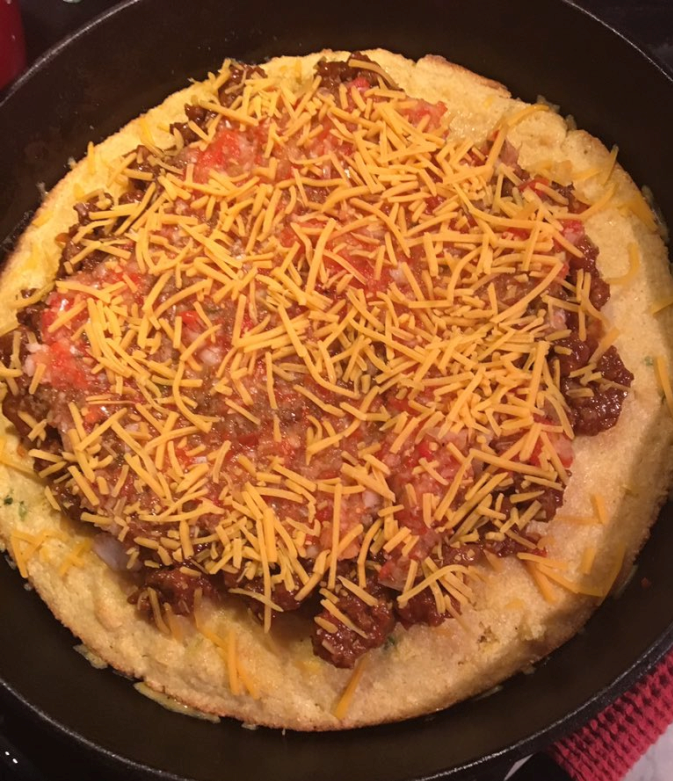 Normally I cook the cornbread in a smaller pan, but I wanted it a little less thick for what I had in mind – so I placed it in my large iron skillet and cooked it for the specified amount of time. At the bottom, I’ll give you my favorite Sloppy Joe Sauce Recipe but you could, of course use any Sloppy Joe Sauce you wanted to use. Heck, if time was of the essence, you could even use Manwich or Sloppy Joe Sauce out of a can. I won’t tell a soul. If you’re a vegetarian like one of my daughters, Brittany, you could use Boca Crumbles instead of ground beef. Still delicious! You could also add garlic, tomatoes, mushrooms – whatever combo your heart desires. However, I wanted the prominent flavors to be the cornbread and Sloppy Joes, so I proceeded with a modest attitude. After I took the cornbread out of the oven (it smelled amazing! ), I buttered it a little bit with grass-fed butter. Why? Because butter, that’s why. 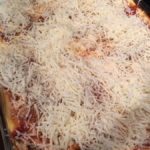 Then I covered it with the Sloppy Joe Sauce (leaving a little bit of an edge for effect), the processed vegetables, grated sharp cheddar cheese, and freshly minced parsley. 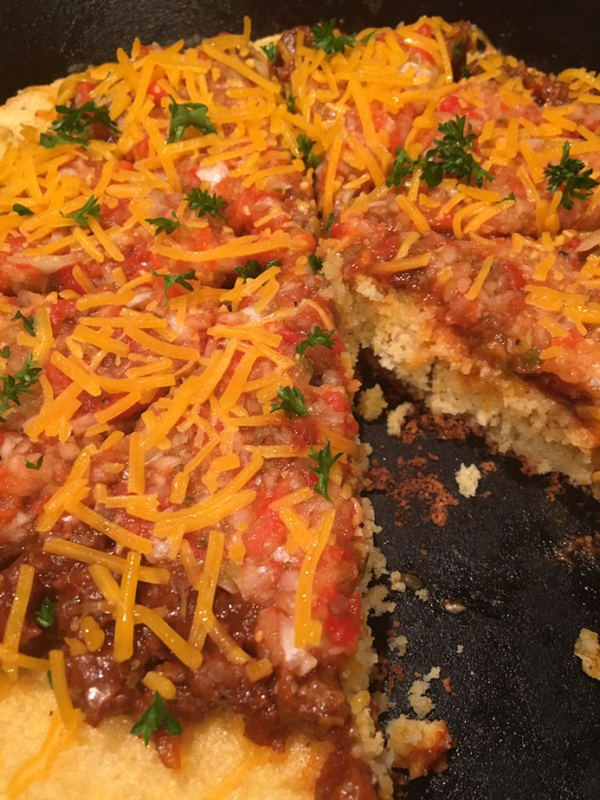 Words can’t tell you how delicious this gluten-free Sloppy Joes Cornbread Pizza was! 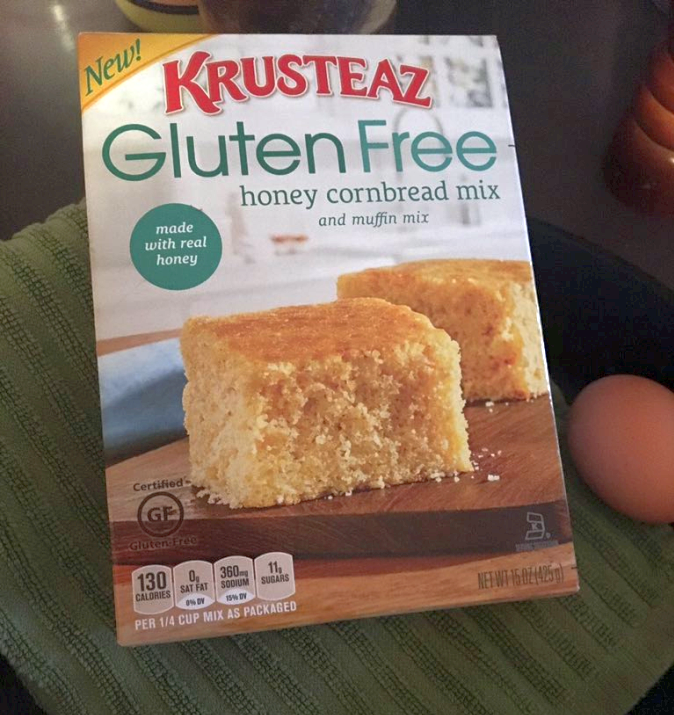 Krusteaz Gluten-Free Honey Cornbread Mix is available in most grocery stores and on Amazon. Place the butter in a hot skillet (on medium heat), followed by the 2 pounds of ground beef, the onion, and the peppers. After the beef has browned, drain and return to the skillet. Move the heat to medium low and add the garlic powder, ketchup, brown sugar, mustard, vinegar, tomato paste, soy sauce, and salt and pepper. Simmer for about 10 minutes. Don’t let it boil – be sure it just simmers. Taste what you’ve created and (if needed) add a little more salt, pepper, tomato paste… whatever you think it may need more of! At this point, I don’t believe I have ever added anything to the sauce, but you do you. 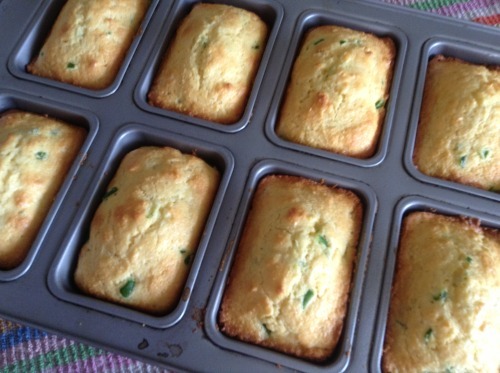 Jalapeno Cornbread: The Quickest, Easiest Way Imaginable with Delicious Results! My husband and I recently visited my Aunt and Uncle, near Louisville, Kentucky. As always, there was lots of laughs, lots of love, and lots of talk about recipes and food! Our family has a fine-tuned appreciation for all things delicious. We talked so much about jalapeno cornbread that I knew I’d make some the minute I got back home. Normally, I make all of my cornbread (muffins, fried, individual loaves, cornbread sticks, etc) using a favorite recipe calling for – of course – buttermilk. I’ve made jalapeno cornbread with this recipe countless times and it’s always fantastic. However, I’ve been trying to add more Quick & Easy recipes to the food blog lately, so I was anxious to try Jiffy Cornbread Mix with jalapenos. I knew it’d turn out fine, because Jiffy is honestly outstanding. Seriously, if you’ve never tried it, do so. No one will ever know it it’s from a mix. Heck, you’ll forget it, yourself. I decided to use my much beloved individual loaves pan because individual loaves of bread are just so dog gone cute. I doubled the recipe (I can’t remember the last time I bought just 1 box of Jiffy) according the the directions on the box, added three chopped jalapenos (they were small – gauge your own preferred amount), greased the loaf pan, and divided the batter into the eight slots. 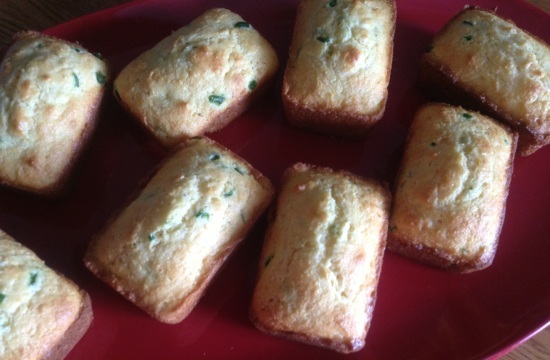 I baked it as the box directed and…bada-bing!… out came beautiful and delicious jalapeno loaves. They’re out of this world with chili, soup, and even eggs for breakfast. Tip: When working with jalapenos, be sure to wash your hands afterward – instead of a Midas touch, jalapenos leave you with a fiery touch that really isn’t a whole lot of fun! Also, be sure to cut away the seeds and membrane and just use the glossy pepper, itself. If I’ve learned anything from years of cooking and baking it’s this: You never stop learning. Ever. When you spend a great deal of time in the kitchen, you’re always learning new techniques, recipes, tips, and downright cool new ways to make things happen. I guess this is true with all things in life, when you think about it, but that’s a little too deep for a Thursday, so I won’t get into that. Below are 10 of my favorite cooking tips, baking ideas, and general “tricks” that I use again and again. I hope new cooks and old cooks, alike, will find them to be useful and inspirational. Most of all, I hope you’ll share your own cooking tips in the comments! I love to bake homemade bread. Whether it’s buttermilk biscuits, sourdough bread, French bread, or cornbread, I’m a bread making fool. A lot of bread recipes call for the dough to rise in a bowl before you place it in pans or shape it into rolls. The absolute best bowl in the world for this your good old-fashioned, woefully under-used glass punch bowl. The shape of the bowl and the slick inner surface lend themselves perfectly to rising dough. Plastic squeeze bottles with lids (like the kitchen squeeze bottles shown on the right ) are too cool. I’m not sure how I ever lived without mine. Not only are they perfect for vinaigrette, homemade salad dressings, homemade honey mustard, and blended oils, you’ll find they have a gazillion and one other uses. You’ll always want quite a few of these bottles around. Trim the tip about halfway down to create a wider “exit point” and you’ll always have one that’s ideal for filling deviled eggs, jalapeno peppers, cherry tomatoes or anything else that needs a precision touch. These are also great for piping certain icings on cakes, cupcakes, pies, muffins, and cookies. Get creative with leftovers. No matter how small and insignificant the leftovers look, you can find ways to give them new life. 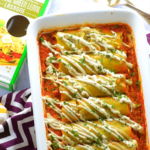 I’ve listed a few of my favorite ways to get creative with leftovers below. Use Boca Crumbles in place of ground beef in tacos, spaghetti, and chili. After seasoning and adding the other ingredients, you’ll never miss the ground beef. You wont’ miss the extra fat and calories either. 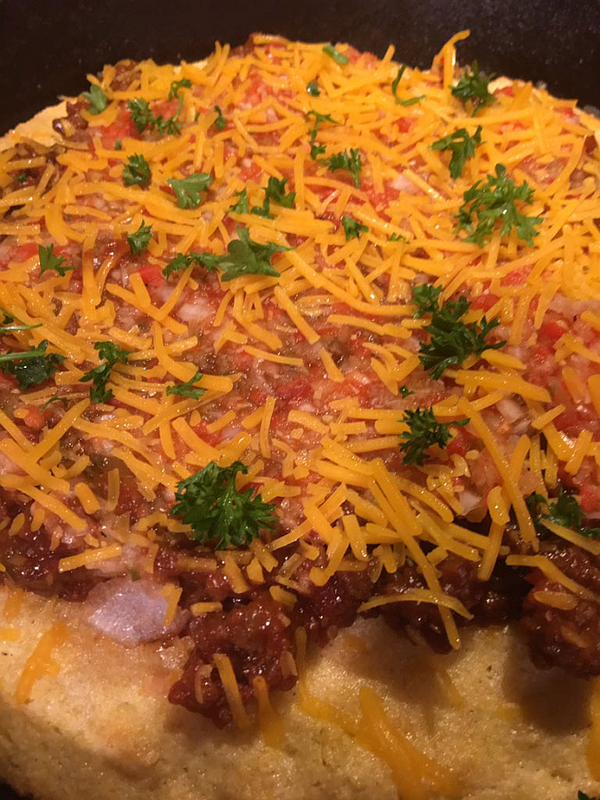 I also love heated Boca Crumbles in taco salad, on pizza, and with Sloppy Joes (or Manwich Sloppy Joes). Speaking of Manwich (a favorite product, by the way), you should check out the Manwich Recipes on their website. 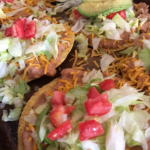 Recipes include Chili, Tacos, Meatloaf, Meatballs, Casseroles, Chuckwagon Beef and Bean Skillet (looks and sounds like something I need to make SOON! ), and more. A lot more. This tip goes along with the one above, actually. Check your favorite product’s (and restaurants, for that matter) website for recipes and coupons. Also, if they have an e-mail newsletter, sign up for it. You’ll often receive recipes and coupons and you’ll be among the first to know about new products. O’Charley’s restaurant, for example, sends out amazing coupons regularly. Keep low-calorie (extra points if it’s healthy!) snacks in reach in the kitchen. Seriously, how easy is it to just grab a snack when you pass through the kitchen?! If you happen to be in the food mecca of the home often, these “harmless” little snacks can really add up. I have it EXTRA tough because not only am I in my kitchen often, cooking and cleaning, my home office is right next to the kitchen and my feet know the way by heart. On the end of the counter, I’ve started keeping a basket of a variety of healthier, lower calorie snacks: Homemade granola bars, South Beach Diet bars (the peanut butter ones are great), fruit, etc. For those with a sweet tooth (I have a couple hundred, myself), Skinny Cow candies have fewer calories than a lot of other candies but they’re just as delicious. Watch Food Network and the Cooking Channel for inspiration and ideas. It’s been my experience that the best shows are on during the day – the ones with actual cooking, that is. When I look at the lineup, I always wish I had a tv near my desk. I would LOVE to watch Paula, Rachael, Sunny, the Barefoot Contessa, and Alton while working! Not only are these tv chefs a great source for recipes and ideas, the tips they throw your way are golden. You can also find inspiration and ideas from shows like Diners, Drive Ins, and Dives. Recipes from all the shows can be found on Food Network’s website and Cooking Channel’s website. Always, always, always have at least one signature dish. If you’re a frequent flyer in the kitchen, you’ll probably have more than one – but make certain you have at least one. The dish everyone wants YOU to bring to get-togethers, the dish your family requests often, etc. YOUR signature dish. When cooking a meal for a holiday, birthday, or other special occasion, it’s best to stick with what you know best. I learned this the hard way one Christmas when I tried a new technique with the ham. I might or might not have ended up in tears sobbing, “It wasn’t the Grinch, it was me! I’ve ruined Christmas!” Who overreacts in the kitchen??? Me??? If you want to try a new recipe for a particular holiday, take it for a test drive weeks ahead of time. If you don’t want anyone in your family to taste it before the big day, make it, taste it yourself, then give it to a friend, co-worker, or neighbor. Trust me.. whatever you do… just don’t whip out anything major on a holiday. Especially not the turkey, main casserole, or bread. Or ham. Ouch, it still hurts. Soaking chicken in buttermilk for at least an hour before baking or frying it does wonders for the flavor. Buttermilk does something magical to chicken and you can taste it in every single bite. If you’ve never made sourdough bread, make this the year you fall in love with the funnest bread to work with and possibly the most delicious to eat. Not only is sourdough bread amazing simply sliced and eaten, it kicks up any meal it comes in contact with. The picture at the top of the post is just one example. I toasted some of my sourdough bread in a skillet (with real butter, of course), then floated the slices on bowls of homemade vegetable beef soup and threw a little sliced mozzarella cheese on top for good measure. 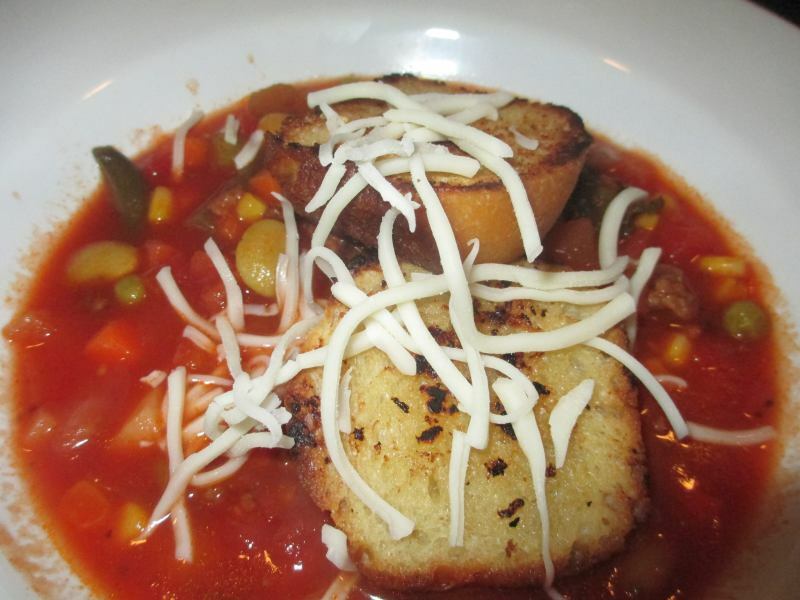 By just taking a few extra little steps, a great bowl of soup went up to notches soup seldom reaches. The sourdough flavor, the buttery crispiness achieved with the skillet… oh, man, is it delicious. 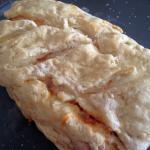 I’ll add my favorite sourdough bread recipe to the food blog this week. If you need “work” with a certain dish, practice! Practice makes perfect and this is never more true than in the kitchen. Gravy, biscuits, omelettes, and fried chicken are just a few things that few (if any) get perfect the first time. Or second. Or third. When you find yourself alone in the kitchen, practice on at least one of these “tricky” foods. Never get discouraged – just get more determined. Never underestimate the importance of a great cookbook library. I write a lot of cookbook reviews on Get Cooking because I’m a cookbook junkie. I’ve collected them since I was a teenager (and, no, I don’t care to count the years). I value my cookbooks like gold. Each one tells a story. I have cookbooks handed down from loved ones, cookbooks given to me from my husband (lots and lots of these and I can remember the occasion for each as well as the first recipe I tried from each), and cookbooks I saw and simply HAD to have. I totally recommend reading these reviews and trying out the ones I rave about. Also, don’t forget about your good old library – you can find some of the coolest vintage cookbooks in libraries. Often they’ll feature a lot of regional cookbooks that are amazing. When you find ones you love, search for them on Amazon or Alibris and add to your own cookbook collection. You’re only going to be as good as the tools and ingredients you use. Even the best cook in the world couldn’t make a 5 star meal out of cheap, poor quality ingredients and old, scratched up pans. Invest in good cookware, pots and pans, small appliances, and kitchen gadgets. Some cooks just don’t know what they’re missing out on when they keep saying things like, “Eh, this knife is good enough” or “I don’t guess I really need that…” You’ll be amazed at the difference a great set of knives make, for example. As for kitchen gadgets, many are incredibly useful (garlic presses, kitchen shears, hand juicers…) – what’s more, they keep things fun and interesting! When frying green tomatoes, squash, or okra, either use cornmeal for the coating or a mixture of cornbread with flour. In my opinion, cornmeal simply tastes (and even looks) a lot better. Write down your favorite recipes and cooking notes for your sons, daughters, grandchildren, etc. My mom and grandmother (on my dad’s side) were EXCELLENT about writing down their favorite recipes and I have my hands on each one. I also cherish the notations each left in their cookbooks. I find myself doing the same thing with mine. I write down the first time I made a recipe, the occasion, and many times even who enjoyed it the most. I also make notes about any substitutions I’ve made. I also write down several copies of my own favorite recipes and cooking tips (in addition to leaving them here on Get Cooking). Long after I’ve moved to Heaven (hoping for a mansion with a huge kitchen and praying there’s lots of coffee and chocolate in Heaven), my daughters will be able to see my notes and recipes and make the food that they’ve enjoyed since they were shorter than our kitchen counters. While I’m not planning on going anywhere anytime soon, I love the fact that I’ll leave behind something that is so important to me. It’s cool to know they’ll think of me every time they make my favorite foods. And I’ll be watching – hoping Emily doesn’t leave the room while something’s in the oven, Brittany doesn’t get too jiggy with the pepper and garlic, and Stephany remembers to do the dishes. Oh, who am I kidding – I’ll be hoping she FINDS someone to do the dishes because it darn sure won’t be her! The girl loves to cook, but washing dishes? Not her thing. I don’t want to end with a tip involving me anywhere but right where I am, thank you very much, so I’m going to end with something I recently discovered. Stone Ground Mustard is the bee’s knees! 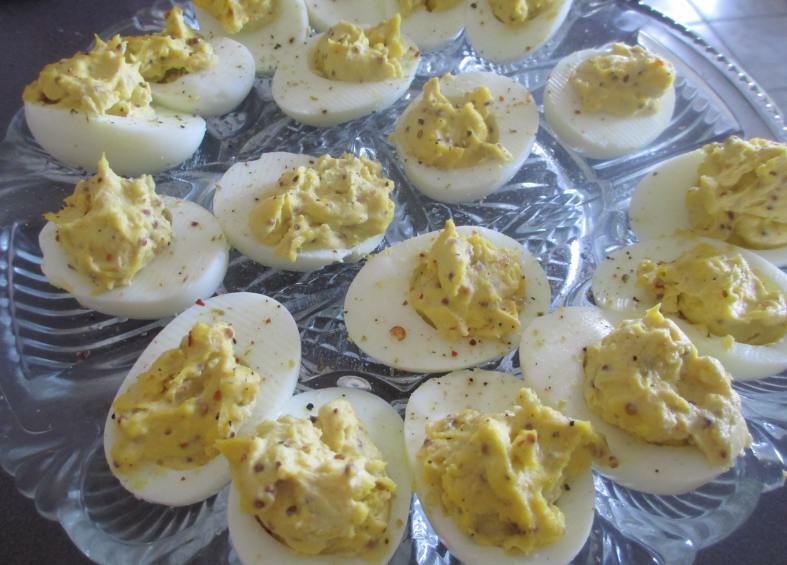 Not only does it jazz up hamburgers and hot dogs, it’s also amazing in potato salad as well as deviled eggs (pictured at the bottom of this post). It’s like mustard’s stronger, older brother and the intensity of the flavor is something I’m loving. Use leftover French bread for French toast the next morning. Leftover bread can be brushed with olive oil, seasoned, toasted, and chopped into croutons for salads that’ll blow you away. Don’t throw out leftover hamburgers or steaks. Throw them into homemade soup, chili, or stew. Save leftover veggies for omelettes the next morning. If omelettes are a little intimidating first thing in the morning, throw them into scrambled eggs. If you have quite a bit of leftover veggies, freeze them for use in soups at a later time. 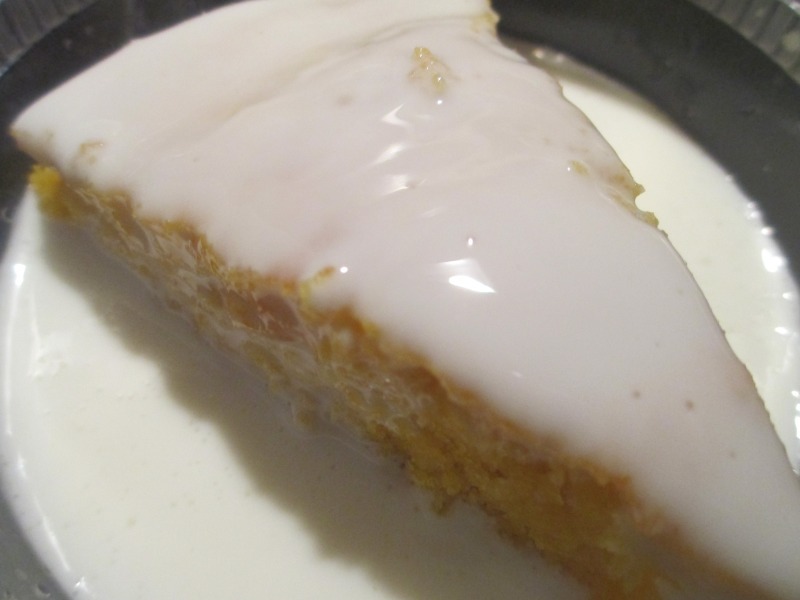 If you have leftover cornbread, here’s a treat that’s much more delicious than it may sound. My grandmother LOVED this – in fact, I got the idea from watching her as a little girl. Cut up leftover cornbread, or slice into wedges (as pictured above) and put it into a bowl – pour a little buttermilk over the top, just to moisten it (or add more, if you’re so inclined). Take your bowl and a spoon and enjoy a delicacy that’ll knock your socks off. It’s so much better than you’d expect it to be. I usually hit it with a little pepper because I’m a pepper fanatic. Throw a little crumbled bacon on top for good measure if you have any lying around. My family is fanatical for cornbread, so I try to have it as often as possible. It seems, for some reason that I make it more often in the fall and winter than I do the spring and summer. I guess that’s because my favorite meals to serve it with are chili and beans, which we have far more often in cooler weather. Coarsely (very coarsely) crumble or cut cornbread into chunks and place in a bowl or large mouth glass. Add buttermilk and eat with a spoon. I SWEAR this is absolutely Heavenly. Serve cornbread the next morning with eggs. You can warm the cornbread up on a griddle (with a little butter, of course) and place a fried egg smack on the top of it. Or, simply eat it with butter and jelly as you would toast as a side. Of course there’s the old school favorite – use leftover cornbread for stuffing! All in all, I still favor it in a bowl with buttermilk. If you’ve never tried this, you seriously don’t know what you’re missing. Buttermilk always makes the cornbread taste better than regular milk. Use a cast iron skillet or pan for the absolute best cornbread or cornbread muffins on earth. Like buttermilk, it somehow makes a HUGE difference. Green Chilies are a great stir-in addition to cornbread. Like pancakes and brownies, cornbread batter doesn’t like to be manhandled. Just combine the dry and wet ingredients, and put the spoon down. Don’t even think about using your electric mixer. The wet ingredients activate the leaveners in the batter, so once you’ve combined the wet and dry ingredients, get it into the pan(s) and get the show on the road. Act fast, don’t doddle. When using leftover cornbread (for the next day), keep it wrapped in the refrigerator. If you’re saving it for cornbread dressing or stuffing, cornbread can be kept in the freezer for 6 weeks. If you’re making cornbread, in bulk, for stuffing, Jiffy Cornbread Mixes are excellent! When making cornbread that’ll be used for stuffing or dressing, add a little sage to the batter. 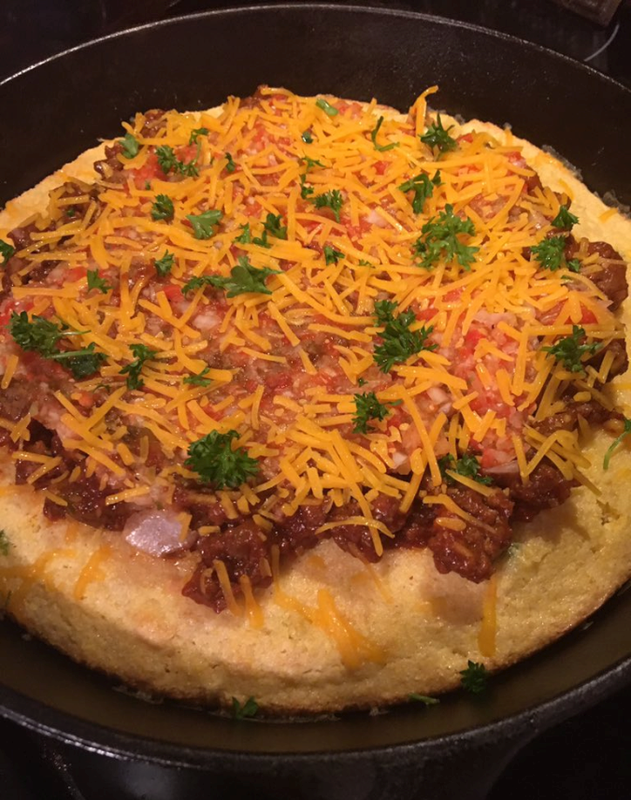 Here’s a recipe for Cheddar Cornbread from Taste of Home. I’ve actually never made cheddar cornbread but, after seeing this recipe, I’ll be correcting that oversight SOON. Here’s an Alton Brown recipe for Creamed Corn Cornbread you’ll love. Adding a little chopped jalapeno to your cornbread batter adds a lot of flavor – and it looks pretty cool too… especially when you make cactus-shaped cornbread, courtesy of the Lodge Logic Pre-Seasoned Saguaro Cactus Pan , shown above. Southern chefs will tell you that nothing bakes cornbread like a good cast-iron pan, and this Lodge Logic cactus pan is among the best. The vessel features a series of five saguaro cactus impressions, each measuring 4-1/4 inches long and 2-1/2 inches wide. The cactus shapes are clever and precise, with a pair of arms that extend out and up in the traditional saguaro manner. Meanwhile, the batter cooks beautifully thanks to the cast-iron material, which heats slowly but evenly and holds its heat far longer than stainless and aluminum rivals. The resulting cornbread cakes and muffins are cooked to the peak of perfection, with slightly crisp exteriors and moist, flavorful insides. It’s the perfect way to add a Southwestern touch to your chili and black-eyed pea recipes. NOTE: Yesterday, I told you I’d be making the Cucumber Salad recipe for supper. It was beyond delicious. My youngest daughter, Stephany, helped me in the kitchen last night and that’s always a special treat. 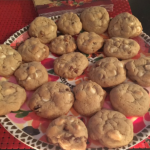 We actually wound up doubling the recipe because we kept sampling so much as we went along! The dill adds such a wonderful flavor to the fresh, crisp cucumbers. Outstanding.